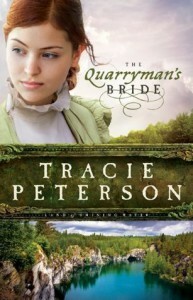 Quarryman's Bride, The (Land of Shining Water) - "A Single Word ... "
Now while this is Not my normal genre of reading material, I found the story well written in my opinion. The storyline was smooth to follow, thus allowing me to sit down and read it in a single evening. It evoked some thoughts of my own past and how things are with my own estranged parents. This book allows the reader to ponder their own feelings towards God and how the characters and self used the power of prayer to fix the strained relationships within the family and how compassion, empathy, love and beliefs are needed in everyday life. The book transport’s you historically back to what life would have been like in the time when the nation was in it’s infancy stage. The research that Tracie Peterson has done for the book gives you the ability to image yourself as a character in 1886. I found that I was able to enjoy the story for it’s self without the feeling of being preached at with every page turn. I also found it to be thought provoking and the storyline continues to pop into my mind at odd moments leaving me thinking along the way. When I go to the library this week I plan to look for more books by Tracie Peterson as I would give this 5 stars out of a possible 5. This book was provide by Bethany House Pulbishing for my honest review and should be taken as such. This review is my own opinion without the influence the author, the publisher or anyone associated with this book.